For the International Year of Light 2015 the MUST network supported the construction of six outreach lasers for use in PI activities (school visits and presentations), exhibitions such as Scientifica, and for integration in the school curriculum. PIs Thomas Feurer, Uni Bern, and Thomas Südmeyer, Uni Neuchatel, purchased lasers for use in their outreach work with schools, for International Year of Light events and science festivals. Today many industrial lasers are based on diode-pumped solid-state lasers. Unfortunately, most of them work in the near infrared regime, typically around 1 µm, which cannot be seen with human eyes. The diode-pumped Pr3+ doped solid-state lasers, however, emit in the visible spectrum and can be pumped by commercially available blue lasers, which is ideal for education outreach. 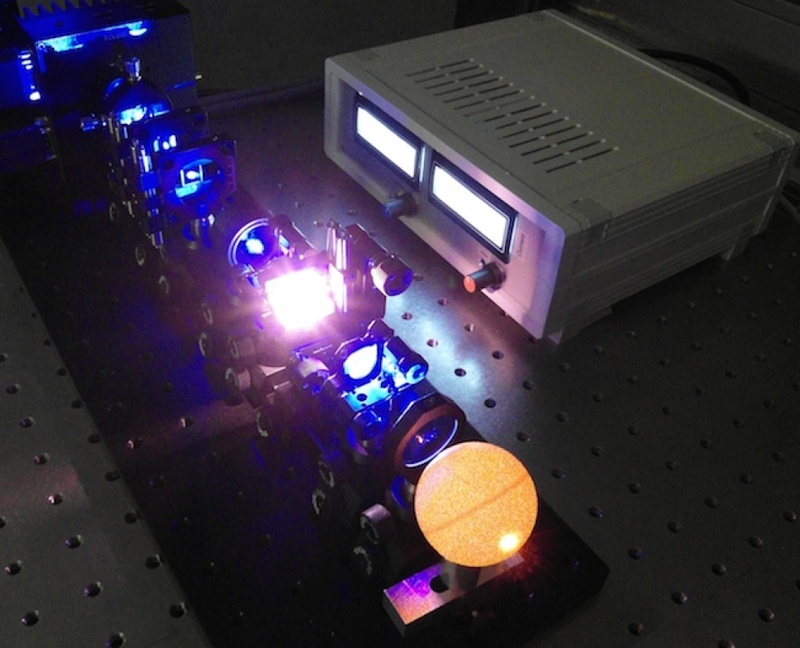 The Keller group is constructing outreach lasers, which were developed initially by Prof. Günter Huber and Dr. Christian Kränkel from University of Hamburg. We use a Pr:LiLuF4 laser crystal, grown by the team at University of Hamburg, which is pumped in the “blue” and emits in the “orange” spectral regime. This is a beautiful laser system, from a color point of view alone, and is ideally suited for teaching and outreach activities. The lasers include a laser diode driver with a temperature controller, which was developed by Prof. Marc Achermann at the University of Luzern. The laser is designed so that all the parts (mirror mounts and lens) can be removed and reassembled. In addition, the users will be able to align the laser and create the laser beam. The lasers were constructed to be used, under supervision, at exhibitions and educational events organized in 2015 following, such as Scientifica 2015 in Zurich and Festiscience Neuchatel, April 2016. They will be also an integral part of a teaching tool on laser light for Swiss high schools, developed in collaboration with Dr. Oliver Sieber and Dr. M. Benz, physics teachers in Zurich. We would like to extend this development in physics education programs at Universities of Applied Science, technical schools, and residential science weeks for boys and girls organized by foundations such as Schweizer Jugend Forscht.